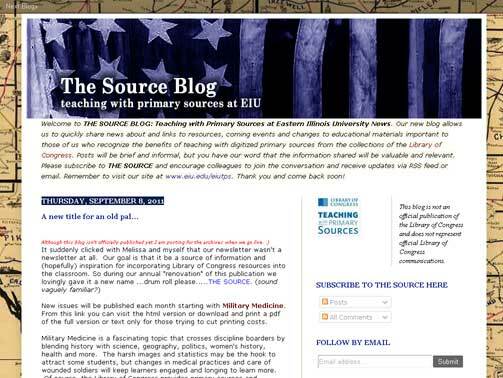 The Source 2.0 "Inventors & Inventions"
THE SOURCE BLOG: Teaching with Primary Sources at Eastern Illinois University News. Our new blog allows us to quickly share news about inks to resources, coming events and changes to educational materials important to those of us who recognize the benefits of teaching with digitized primary sources from the collections of the Library of Congress. Posts will be brief and informal, but you have our word that the information shared will be valuable and relevant. Please subscribe to THE SOURCE and encourage colleagues to join the conversation and receive updates via RSS feed or email. Each month TPS EIU Director Cindy Rich joins Tom Grissom of the College of Education and Professional Studies Instructional Technology Center as co-host of his popular podcast, TechTalk4Teachers. Below is a list of recent episodes which are available in the archives. For a complete list of all episodes click here. Subscribers receive an email when a new issue is published. We respect your privacy and will not share your email address.